We all want to get the lowest price on car insurance as possible, but buying coverage is not a one price buys it type of transaction. There are numerous car insurance price factors that go into getting your premiums set. What is even more confusing, the rates for the type of coverage you want can vary so much by each individual carrier. You might get an expensive quote from Geico and then a much cheaper rate from State Farm. This is because insurers have different metrics that they base risk on, above and beyond the standard ones we will go over her. The good news is by comparing quotes with sites like Rodney D Young auto insurance, you can easily get the cheapest policy, all in a matter of minutes. Apply for your free quote now and see how easy it is to have hundreds on auto insurance. There are more price factors that go into setting your premiums that you might think of. It is kind of like the search engines such as Google and Bing, which use sophisticated algorithms to set the search results you see. The same thing is going on with deriving your auto insurance pricing. Insurers are getting more sophisticated each year, comparing millions of pieces of data and adjusting their premiums in conjunction to the risk a particular driver poses. While there are pricing factors that you have no control over, such as your age, there are things you can control that will help lower your ins bill, like the car you drive around in. Let’s take an up-close look at both things you can and can’t control, so you can better understand how car insurance pricing works. One of the biggest criteria that affect insurance costs is a drivers age. This is because carriers data on accidents show younger drivers, under 25, get in much more accidents. The stats just do not lie. Insurance providers charge more to this group of motorists because they simply get into more accidents. High school and college-aged drivers between 16 and 23 pay the highest rates out of any group. Insurers have to discriminate and charge more because the claim costs for these motorists is really high. Once you turn 25, if your record is clean, you can expect your rates to go way down. If you are a young licensed motorist, get on your parent’s policy if possible. Also, take a safe driver class. This will not only improve your driving but save you 5% or more off your bill. It might be frustrating that you have no control over your age, but you can save a lot with insurers like RodneyDYoung online. All you need to do is get quoted. Believe it or not, females get into less serious accidents and less frequently than male drivers. They also get charged with fewer DUIs. This means they are rewarded with lower premiums because they pose less of a financial risk to insurers. If you guys out there think this is unfair, tough luck, the stats don’t lie. There are things that you do have control over that can lower your auto insurance rates quite a bit. Let’s take a look at the most important ones. Do you ever wonder why insurance companies always ask you what your zip code is when you fill out a quote? This is because they are calculating the risk associated with the area you live in. Complex data is analyzed by each carrier on accidents, vehicle thefts and even natural disasters in each zip code in the U.S. In general, cities have more accidents per person than rural areas. If you want to get a better rate on auto insurance, move out of the city into a more rural environment. This is another huge factor that will determine your premiums. Basically, the more your car costs the higher your insurance bill will be. Likewise, the cheaper your car and the less it is worth, the lower your insurance costs will be. If you are in the market for a new vehicle and want the cheapest insurance possible, stick with a four-door sedan with a 4 or 6 cylinder engine. Avoid costly luxury and sports cars, as they have some of the highest insurance rates. This is another major factor that insurers look at to calculate your ins rates. To get the lowest premiums, you need a clean driving record and no DUIs, reckless driving, or unpaid tickets. If you do get a ticket, go to driver school and get it off your record. This simple class that just takes a few days can save you hundreds in lower premiums. The smart and savvy shoppers know that the best rates for car insurance are online. 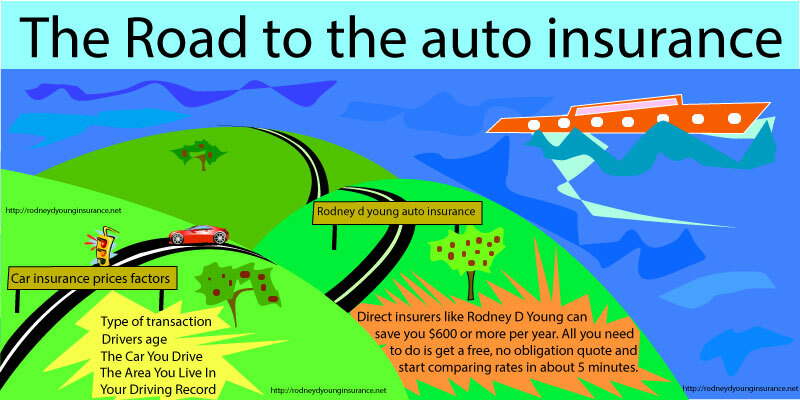 Direct insurers like Rodney D Young can save you $600 or more per year. All you need to do is get a free, no obligation quote and start comparing rates in about 5 minutes. You can buy your policy online and even print out I.D. cards. This means you can not only save a bunch of money but get insured in less than 30 minutes, with all the necessary documents. Apply now for better rates and see the difference for yourself.